Two Knights Defence 4.Ng5 sidelines - Chess Gambits- Harking back to the 19th century! With 4.Ng5 White defends the e4-pawn and attacks f7, and Black must do something to address the threat. Probably the most controversial try is the Traxler Counterattack with 4...Bc5! ?, which invites White to grab the pawn on f7, and gives Black dangerous attacking chances after 5.Nxf7 Bxf2+, in tremendously complicated positions. After 5.Bxf7+, I think Black's kingside attacking chances probably offer only partial compensation for the sacrificed pawn and misplaced king, but on the other hand, there is no clear refutation and Black tends to score well in practice. Black will usually continue with ...Rf8 and ...Qe8. Similarly promising for White is 5.d4, which leads to positions where Black has plenty of piece activity in return for the sacrificed pawn but Black has to be more careful of the potential for the black king to become exposed, following 5...d5 6.Bxd5 Nxd4 7.Bxf7+. Most logical is 4...d5, striking out in the centre, but one of the key points behind 4.Ng5 is that Black can only take advantage of White's loss of time by sacrificing a pawn. If Black meets 5.exd5 with 5...Nxd5, then this leaves Black open to dangerous knight sacrifices on f7. White can afford to sacrifice the knight immediately if desired, with 6.Nxf7, the Fegatello or Fried Liver Attack, which is the most forcing way to send Black's king out into the middle of the board. This sacrifice appears to be fully sound, though it is unclear whether it gives White a theoretical advantage. One word of warning: many sources recommend the rook sacrifice line 6.Nxf7 Kxf7 7.Qf3+ Ke6 8.Nc3 Ncb4 9.a3? 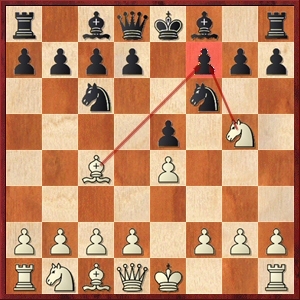 !, but this is unsound, and White should continue with 9.Qe4, 9.0-0 or 9.Bb3 instead. White can also defer the sacrifice with 6.d4, the Lolli Attack, which is more likely to give a theoretical edge with best play, though there are some responses from Black that prevent White from carrying out the knight sacrifice on f7. The other important sidelines are 4...d5 5.exd5 b5! ?, the Ulvestad Variation, and 5...Nd4, the Fritz Variation. With best play the two lines transpose to each other, but White has to be prepared to retreat the king's bishop to its starting square, after 5...b5 6.Bf1, or 5...Nd4 6.c3 b5 7.Bf1, which is not easy to find without preparation. The bad news for Black is that with best play Black probably doesn't get full compensation for the pawn following 7...Nxd5 8.cxd4 Qxg5 9.Bxb5+, though in practice White tends to deviate, especially at club level, and many of White's alternative options allow Black to generate very dangerous attacking chances, particularly utilising the a8-h1 diagonal with bishops on b7 and d6 bearing down on White's king. My personal view is that 5...b5 gives White more scope to go wrong than 5...Nd4 does. However, none of these lines are as sound as 4...d5 5.exd5 Na5, which due to its importance is covered on a separate page.